Over the past few decades, the shower has revolutionised the way we use our bathrooms. So what’s new in 2019? In this blog post, we’ll show you 5 of the best shower ideas for 2019. Whilst the bath will always be top dog when it comes to UK bathrooms, the shower is fast gaining prominence as the main way to enjoy your daily wash. Much of its popularity is to do with the breakneck speed in which we live our modern lives, along with the water-savings that a shower can bring—especially when water bills are so expensive. Whatever type of bathroom or ensuite you’re looking to create, we’ve got some fabulous shower ideas for the year ahead. One of the main issues faced by UK homeowners is a lack of space and this is especially true when it comes to the bathroom. There are some tried and trusted tricks which can help create the illusion of space in your bathroom, like using mirrors and lighting. Another easy way to make your room feel more spacious is to use a frameless shower enclosure or walk in shower area. Better still, you could even combine your shower glass with lighting for a designer look. 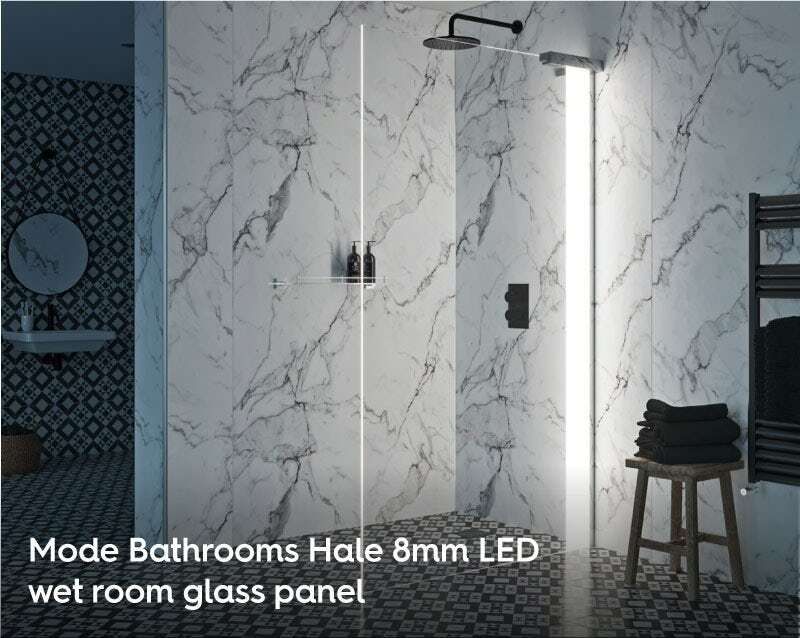 New for 2019, this wet room glass panel comes complete with a 5 volt LED unit, creating a genuine designer feature in your bathroom. IP65 rated, which means it is suitable for use in splash zones, it is supplied with a rechargeable battery pack and charger, so needs no electrical wiring. The panel is made from British Standard 8mm safety glass for peace of mind and, as it is low iron glass, it remains clear throughout when illuminated, without that green tinge you get with regular glass. A motion sensor built into the frame will automatically switch the light on when someone approaches, shutting off after 45 seconds when no movement is detected. Available in right or left hand fitting versions, it really will provide that extra-special finishing touch to your bathroom. Your choice of shower valve is arguably as important as the shower itself—some may say more so. Shower valves vary greatly in style, design and function according to how much you wish to spend and what you want them to do. From exposed valves, which sit external to your wall, to concealed valves, which offer a sleek, minimalist appearance, there are so many to choose from, so we’ve picked out one of our favourites. For a highly contemporary, on-trend bathroom design, this stunning shower valve is a great choice. With separate controls which are the only exposed parts of the valve, it offers a truly minimalist look. Precise thermostatic control means you can be assured of a consistent temperature, no matter how much water is used elsewhere in your property. Plus, with an anti-scald cut out device, it’s safe for the whole family to use. Available in a range of different shapes and also in twin and triple versions (with or without diverters), you’ll find the exactly the right choice for your bathroom or ensuite in 2019. As I already mentioned earlier in the blog post, lack of space can be a real issue in bathrooms. Fitting a shower enclosure into the tightest of spaces can sometimes leave you with little room to manoeuvre. That's where your choice of shower can be of the utmost importance. If a concealed shower valve is out of your price range or simply impractical, an exposed shower valve is the next best option. However, if you have a compact shower enclosure or shower bath, this type of valve can take up vital inches. This cleverly designed vertical valve helps to maximise space. With a control on the side and one on the top of the valve, it only projects outwards by a mere 80mm. 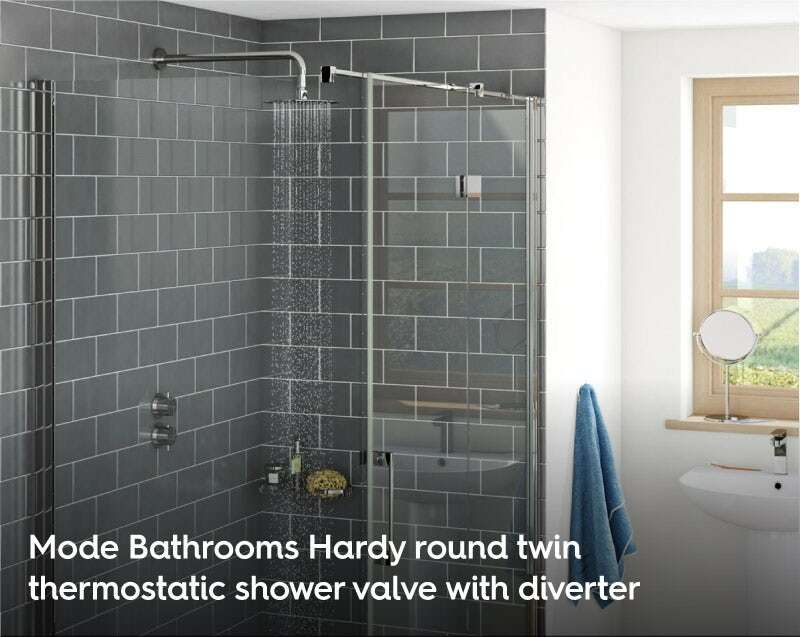 This thermostatic shower can be completed with a height adjustable slider rail and bracket, which is ideal for families or shared bathrooms, plus a flexible hose and lightweight ABS plastic handset, finished in sparkling chrome. One issue many people face, when choosing a traditional style bathroom or ensuite, is what to do with the shower enclosure? In most cases, you may be forced into buying something that is contemporary in style, which seemingly doesn’t fit with the rest of your classic décor. It’s something we’ve been thinking about long and hard—and we think we’ve found the solution! Another new addition for 2019, our range of traditional shower enclosures from The Bath Co. perfectly complement vintage interiors. Complete with classic detailing such as traditional stainless steel handles and top cover cap finials, you’ll now find a selection of different shapes, from rectangular to quadrant, and designs to fit with your bathroom theme. 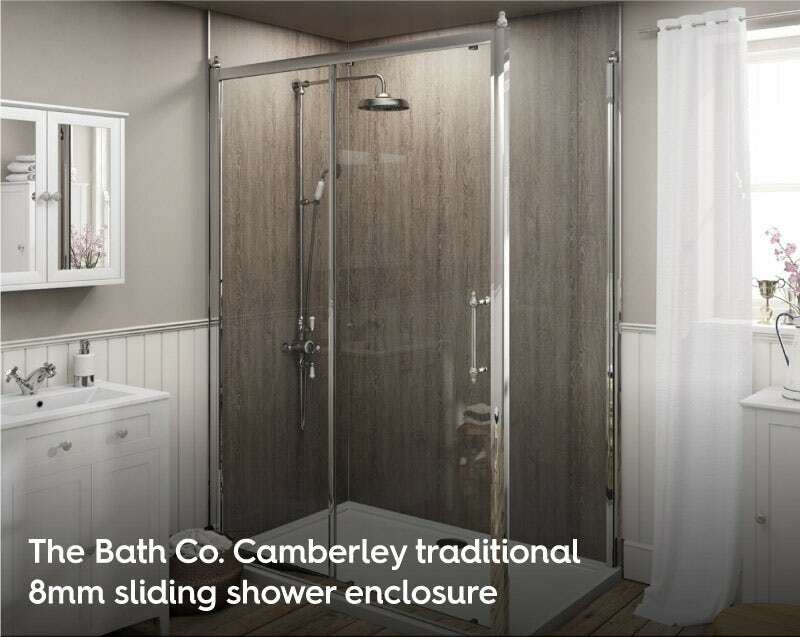 The Camberley enclosure also comes with all the mod-cons you’d expect, like magnetic door closing, easy clean safety glass and scratch-resistant aluminium profiles. It’s the perfect combination of modern technology and classic style. Undoubtedly, one of the top presents this Christmas will be a smart home system. Whether this is Amazon Alexa, Google Home or one of the many different options on the market, you may be tempted to wonder what other capabilities it has/other purposes it can be used for. The great news is, you can now control your shower with your voice alone. 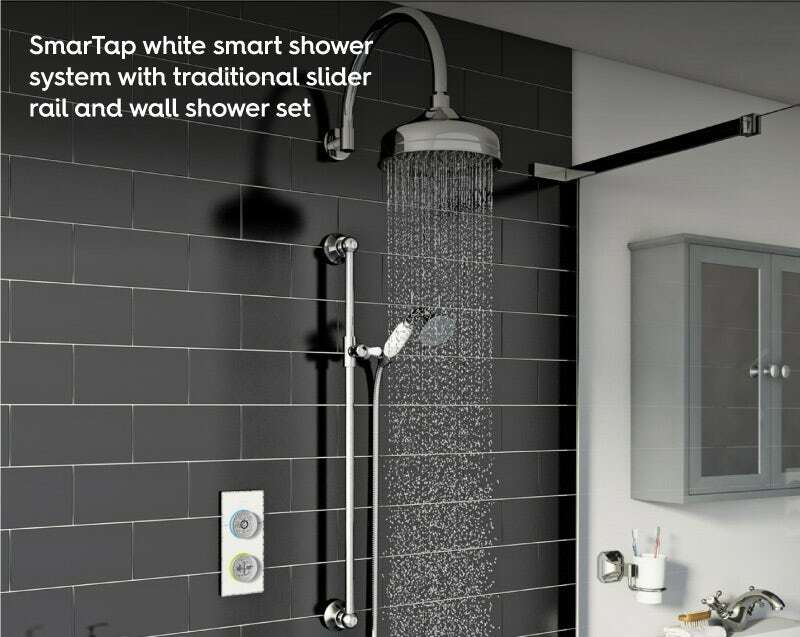 SmarTap is a smart showering system which is exclusive to VictoriaPlum.com in the UK. 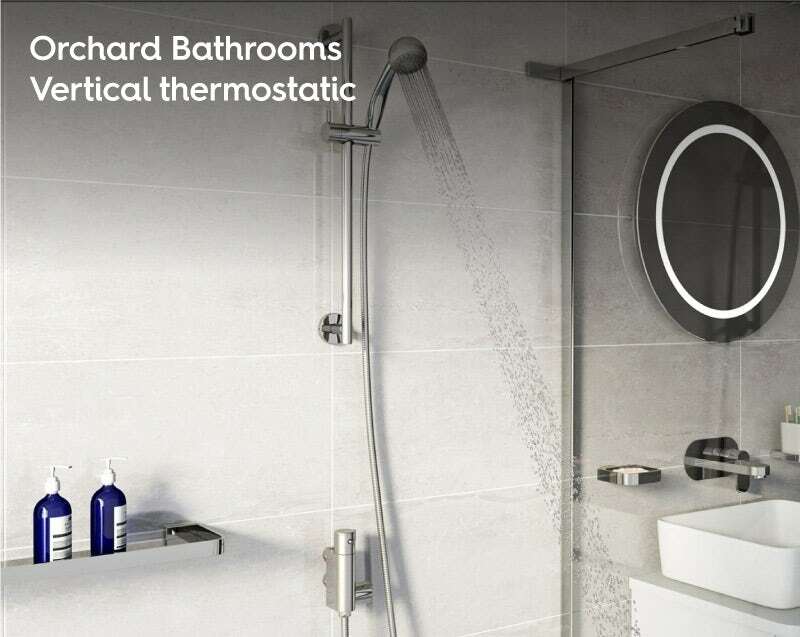 This state-of-the-art product features cutting-edge technology which allows you to fully customise and control your showering experience using a dedicated app or by integrating with your existing smart home system. With German-made components, the stylish e-valve can be easily installed, receiving Over The Air updates to future-proof your bathroom. Offering precise temperature control, time limits, sequencing and much more, it really is the future of showering. You can even add a second controller for your bath or basin. Also, what’s great with SmarTap is that it can even work with your existing shower set, or a wide choice of styles and designs, with dual or even triple outlets. Discover more about SmarTap today. Thinking of refurbishing your bathroom, ensuite or cloakroom this year? We’ve got some fabulous new bathroom ideas for 2019 which will help inspire you. For all your showering needs, why not browse our fabulous range of showers and shower enclosures? Whether you have the space for a show-stopping roll top or simply need something that uses as little space as possible, we’ve come up with 5 fabulous bath ideas for 2019.